It's too bad that the device couldn't survive a three foot drop. I feel conflicted at the moment: on one hand, I feel bad that I essentially wasted $500 (phone + docking kit), but on the other hand, I couldn't care less about this monster that I never loved since day one. Besides its pitiful build quality, it had its share of software problems too, such as clock randomly going 15 minutes ahead or sudden rebooting syndrome (StreakDroid Gingerbread). I recommend a phone with gorilla glass. My Dad's paid a small fortune to fix his iPhone 4S screen. 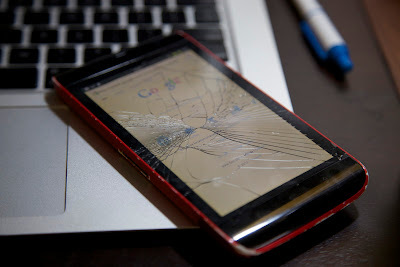 Though... if you break a gorilla glass screen, it costs more to replace (the glass is fused to the display). If you have abundant wifi, you could just go with a nexus 7 + skype. Amusingly enough the Dell Streak does have gorilla glass and so does the iPhone. The problem with gorilla glass is that while it's tough to scratch, it's very easy to shatter.